This Blog Is Dedicated To Those Who, The Moment After Receiving A Cancer Diagnosis, Assume The Identity Of "Cancer Survivor" For The Rest Of Their Natural Lives. I am frequently asked if I know any long term survivors of appendix cancer besides myself. Well, since I’ve started this non-profit in 2008, I have been in contact with over 2000 newly diagnosed appendix cancer patients, I think it’s actually closer to 3000. But most contact me when they are diagnosed and I communicate with them through their surgery and their return to normal life, but after awhile most stop communicating with me. So I don’t know how long they’ve survived even though I’ve been doing this for 10 years. 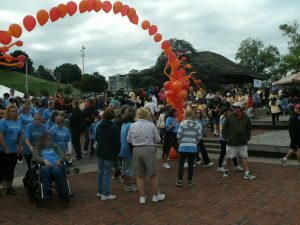 I have met many long term survivors in Baltimore Maryland, though, where renowned appendix cancer specialist Dr. Armando Sardi hosts a 2.2 or 1.1 mile walk (now it’s in the Baltimore Zoo!!) called Heat it to Beat It, referring to heated intraperitoneal chemotherapy. It is a wonderful way of meeting other survivors! I went for the first five years, I was there at it’s inception, but have missed the last three. I AM going this year though!!! I will also represent this organization there. Heat it to Beat it is a WONDERFUL experience! There are several organizations there, including my own, that are non-profits devoted to appendix cancer. Dr. Sardi always has a wonderful presentation, the walk is beautiful and there is great food offered. Most of all, though, you get to see and meet hundreds of people who have been diagnosed with and survived appendix cancer. It is so inspiring! There is also a reception the night before the walk. If you want to register for the walk, I started a team for this organization. If you sign up, register for the team Appendix Cancer Connection. You don’t have to donate any money, your registration fee is your contribution for our team. You can donate more if you want, but I would never expect that, we all have lots of medical bills. This is the link to register: Heat it to Beat It. I’m doing it cheaply this year! I got a $95 flight on Southwest by letting them send me their credit card, which I don’t need to keep if I don’t want, just pay the $95 bill. I am also, for an adventure, staying in this hostel, the HI Baltimore hostel, and not a hotel! It’s only $30 a night and has great ratings! I’ve only stayed in a hostel once before when backpacking the Appalachian Trail, and that was actually my best experience on the hike because of the great people I met. So I’ll stay there for 2 nights. If any of you come to the walk and want to stay in the hostel with me, that would be great! Below I have a picture of the beginning of the walk in 2011. Again, it is a GREAT experience and I would love to see you there! And you would meet so many other survivors and leave with a great sense of hope! It’s supposed to be springtime, but it’s a bit late coming this year! We are supposed to have twelve hours of snow starting tonight, though it’s not supposed to accumulate. But the grocery stores and gas stations were really busy today! I’ve always thought of springtime as a time of new beginnings. I personally prefer, if I am going to make New Year’s Resolutions, to make them on May first! It a time when all that was dead comes back to life, when the world is again filled with color. This year I’d like to lose a little weight and get in shape to go backpacking and biking! Last year I did a bicycle century, rode my bike 100 miles in a day. I did that once before, six month after I completed chemo. I did trained for it while I was on chemo! I was asked again today what I did differently after my cancer diagnosis. Did I live my life differently, did I change my diet? The answer is no, I lived my life after cancer exactly as I had before cancer. I did then and still do now sometimes eat fast food. I still occasionally eat junk food, and did right after my cancer diagnosis and treatment. I rode my bike a lot after the cancer diagnosis, but that was kind of my emotional outlet, when I felt scared or stressed I rode my bike. I remember on a bad day riding my bike in the rain when it was only 40 degrees! I smoked when I was diagnosed with cancer, and didn’t quit until 2 years after my diagnosis….getting diagnosed with cancer makes it very hard to quit smoking if that’s how you deal with stress! So I did nothing “magic”: to survive Stage IV signet ring cancer for so many years. I just got good medical treatment. I’ve had some ask me about support groups. There are not usually in person support groups for this cancer as it is so rare. I know of an online one, PMP Belly Button Club. I also have forums on my new web site that I hope will become support groups. They are for patients and families. Those who read this blog, please try to sign p for the forums! I’ll be there! Maybe we can get a support group going! It is a tad tedious to sign onto the forums, but that is a good thing. I had a forum on a previous web site that was 80% spam because it wasn’t as secure as these forums. I hope springtime is filling you all with the sense of a new and beautiful beginnings! My wish after being diagnosed with and surviving cancer, was that when it is my time to die, I want to just die rapidly. I don’t want to live to contemplate my death and my losses again. My father died the way I want to die. He was sitting in his recliner one night watching TV, and yawned. My mom asked him if he wanted to go to bed, and he said in a bit. Then he quit breathing and his heart stopped. He just died. He didn’t have to contemplate losing his life, his loved ones, his future. He was very fortunate. But as a nurse I am always looking at statistics. Unfortunately, 90% of us will die slow deaths from chronic disease. Deaths like my father’s are only 10% of all deaths. Only one in ten are blessed with those deaths, dying in your sleep in your bed…..
As I have been in the cancer community so long, I have communicated with many who are dying of cancer. As I want to support cancer patients, I want to support ALL of them. I want to help those seeking treatment, but I also want to help those who will succumb to their disease. I have made some friends I have lost to appendix cancer. In order to get better at helping those who would die from cancer, I worked as a volunteer for a hospice organization for 6 months. I worked as a respite aid. I stayed with cancer patients while their families went out for dinner or to appointments. Sometimes families just needed to get away for a few hours. I learned how much hospice can offer. The hospice I worked with offered nursing aids who would bath the patient, change bed linens, feed patients and even cook meals. Nurses saw the patients often and were on call 24/7. Patients were never allowed to be in pain or to be anxious. Counseling was offered as were clergy services. Hospice workers and volunteers would help patients make memory boxes for those they were leaving behind. The hospice offered grief counseling to families for a year after the patient had passed. Patients last days were made comfortable spiritually, emotionally and physically. The sad thing I’ve learned about hospice is that usually patients enter hospice only days before they die, when they could have had hospice services for 6 months. Hospice services help both the family members and the surviving loved ones. When I know I am nearing my end times, I want hospice care. For what it’s worth, in my cancer journey I learned of one woman who entered hospice (to enter a doctor has to say they expect you to die within 6 months), and she didn’t die! She lived for 8 years with hospice services! At least with her hospice, once you were in you could never be discharged! I’ve been recently speaking with someone newly diagnosed, and I was remembering how I felt when I was newly diagnosed. Interesting, someone I think said, “but we all know we are going to die”, as if knowing that was a given. As if knowing I might die was something we all knew every day. But when I was diagnosed, I was told by a respected cancer center at a major city university hospital that there was no treatment for my cancer. And we know that cancer that is not treated is fatal. My kids were only 10 and 11. That meant I would not be there to see them finish grade school. Not see them grow up, not be there for their first dates, their first boyfriends, learning to drive a car, their first job,marriage if they chose to marry. I would involuntarily abandon my children. What was the worst thing a mother could do….abandon her children. I wouldn’t get to grow old with my husband. He would have to raise our children alone. I wouldn’t go back to school for my Master’s degree, I wouldn’t go on more vacations, I’d have to leave my job. Funny, at the moment I can’t remember where I was working when I was diagnosed, so I guess my job wasn’t really important then. But the sense of impending loss was overwhelming. Though the day before I knew I would someday die, knowing that I likely WOULD die in a limited amount of time was totally different. I remember thinking if I died, those who loved me would lose me, but I would lose EVERYTHING!!! Everything I knew, everything I did, everything I hoped for, everyone I loved. Facing a potential death sentence is MUCH different from knowing you will someday die. The day I was diagnosed, my “normal” life was gone. Even when I had some hope, when I was going to get treatment that was 28% successful in a clinical trial, I still had a good chance of not living more than another year or two. I read everything, and for my particular variety of appendix cancer, numbers said it was 90% fatal, some research I read didn’t even give a number, it just said outcomes for my particular cancer, signet ring, was “poor”. The other varieties all had numbers for survival, not mine. Take my advice, don’t look for survival numbers! The truth is that many of the numbers include treatment that only included the removal of the appendix and a hemicolectomy and IV chemo, not the cytoreducation surgery and HIPEC, which has a much better outcome. The number also include some that received no treatment at all. I think I remember someone telling me I was lucky, because I probably lived everyday like it was my last, appreciating everything and stopping to “smell the flowers”. I did live for awhile like every day was my last, and it is a horrible way to live! Think of your day, thoughts you might have. Your daughter’s birthday is next month, you are going for lunch with a friend next week, vacation in 6 months. You have things you want to accomplish at work tomorrow. We all live assuming and comforted by the fact that we have a future. We look forward to things in the future, we dream. That is taken away when you feel you may have no future. For a long time I didn’t live every day like it was my last, but I didn’t plan my life beyond the next CT scan, which was in three or six months. After I had a clean CT scan, I could plan my future only until the next one. That was also a difficult was to live. It was a relief when CT scans became once a year. I did appreciate the milestones I have able to enjoy. My daughters’ graduations from grade, middle and high school, teaching them to drive, being there for first boyfriends. Both have now graduated from college and one has married (I am not a grandmother yet). I will be a 17 year survivor in May, May 16th. I am not considered cured, they don’t use that word anymore, I am just living in long-term remission from cancer. I remember when I was younger they called cancer cured if you lived 5 years cancer free; no longer, but that’s okay. I no longer get CT scans or see an oncologist. I don’t currently fear a recurrence anymore, I feel I am just as likely to get a new cancer. You lose your sense of “normal” when you are diagnosed with cancer, but in the end, you can develop a new, and even better “normal”. I will be attending an educational offering this week about a new cancer therapy, Cart T cells. It is a form of immunotherapy. I’d been interested in immuntherapy before, getting your body’s own immune system to destroy cancer. Cancer has a way of currently evading our immune system, so our immune system is not usually able to defeat cancer. The trials I’ve seen of immune therapies in the past have not been very successful. Cart T cells are a form of immunotherapy that seems to be very successful in fighting certain blood cancers (not solid tumor cancers like ours). It is very effective against some leukemias and lymphomas (blood cancers). I am still learning, but what I have read is that white cells from the immune system are removed from the patient (blood is removed from the patient and the white cells are taken out of the blood and the rest of the blood is returned to the patient). These white cells that are removed are genetically altered to fight cancer, then are multiplied and returned to the patient. I read of a clinical trial in which 30 children with a form of leukemia who had failed all other treatments were treated with this immunotherapy. 27 of the 30 experienced complete and long lasting remissions. These were 27 children that would have likely died form their cancer. That is amazing!!! I’m hoping that since you are only returning the patient’s own blood cells to them that there are no side effects. While this treatment currently would not help any of us with appendix cancer, they are working on advancing this therapy to work on solid tumors like ours. So maybe one day! It’s possible there would be a treatment that did not involve any chemotherapy or surgery to cure cancers. I am attending the educational offering this Thursday evening. I’ll get back to you to let you know what I’ve learned!